Jenia Ravcova follows up on Jenny Judova's Art Map London project and considers the value of crowdfunding in the art world. For more on Art Map London see also Benjamin Bridges article 1 Day 4 Makers. 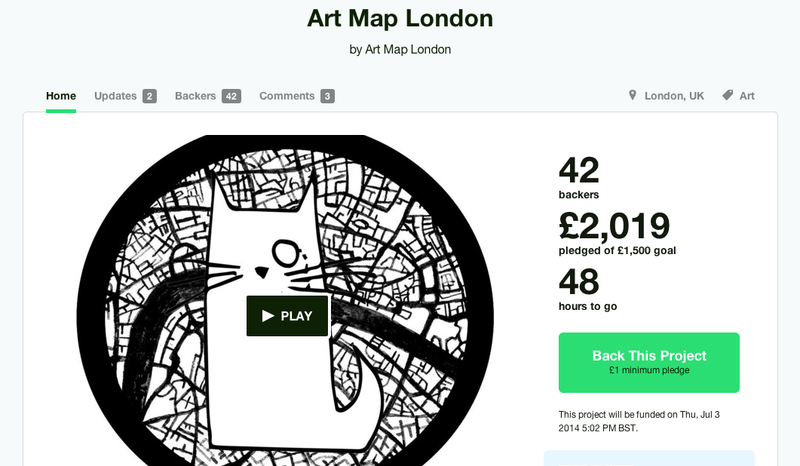 You may not have heard of ArtMap London yet, but soon you certainly will. ArtMap is an independent art events listings website dedicated to promoting the arts community and events happening in galleries and artists-run spaces around London. Armed with enthusiasm, vigour and entrepreneurial spirit, its founder Jenny Judova is on a mission to make ArtMap London the go-to resource for seeing art in the capital. Gone are the days when the city’s art aficionados struggled to find their way into private openings, artists’ talks or screenings, ArtMap brings them what they needed – a curated, consolidated and freely accessible list of art events across town. The website started several months ago when, having moved from Glasgow where she studied art history, Jenny discovered that London did not have either an online or a printed arts listings resource. Soon after what had started as a methodical approach to managing her own diary grew into a full-time job. one of the artists supporting her Kickstarter. Jenny would share information about events with her friends on Facebook and Twitter and, as appreciation and positive feedback began coming her way, she realised there was a need for a listings service amongst London’s art-loving crowd. 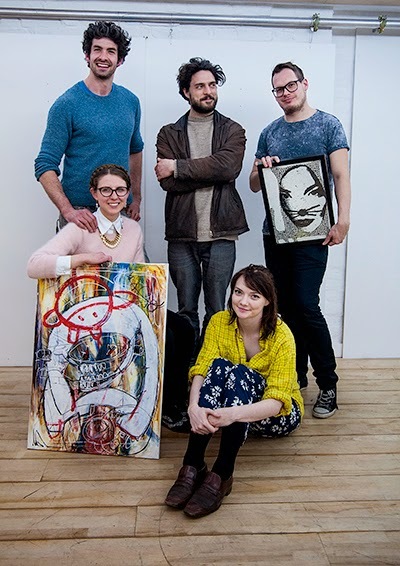 ‘When I started I found it hard to believe that London did not have a resource for art events. It has websites and magazines that do the general cultural listings, but when it came to art, most concentrated on listing exhibitions in big museums. 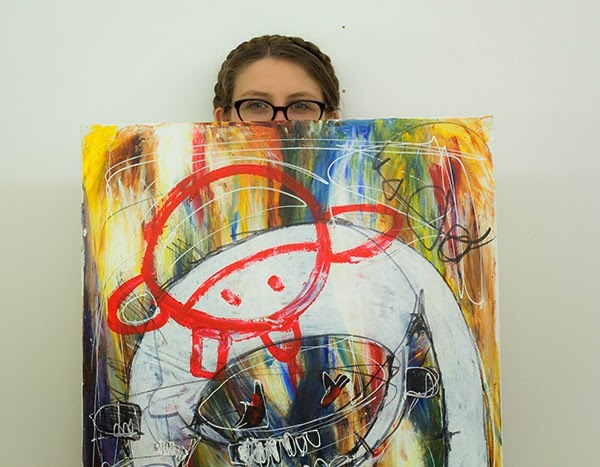 Thus emerging galleries and artist run spaces were underlooked,’ says Jenny. This meant that London’s rich scene remained unknown to the wider public; its audience was limited to those in the know. Fast forward only a few months and ArtMap London boasts a lengthy list of galleries, artist run spaces, foundations and fairs that list private views, late openings, talks, screenings and brunches that happen on their premises. More than just an information resource, it has grown into a dedicated and growing community that reaches its audience through a variety of online platforms. However, ArtMap is about more than just providing a convenient and much needed service for art enthusiasts, connoisseurs and professionals. What Jenny hopes to achieve is to change the way Londoners enjoy art, engage with it and consume it. By making information freely available and convenient to use, a project like ArtMap aims to encourage a wider community to see and enjoy more art, while at the same time allowing London’s smaller galleries to reach a broader audience and achieve greater exposure. Part of this democratisation process sees artists and creative individuals bypassing the traditional channels to reach their audience. Speaking at the event were three young women who have all successfully crowdfunded for their creative projects using the Kickstarter platform: Irina Turcan, co-founder of Art-i-curate, Lucy Sparrow, whose Cornershop raised over 500% of the asking sum, and Miriam Elia, author of We Go To The Gallery, a mock-Ladybird series book and a satire of the contemporary art world. The day after the book was published, Miriam was charged with breach of copyright by Penguin Publishing. The case attracted so much attention to her work that the book now sells for around 50 times its original price. The charges were not sustained and Miriam now plans a second edition of the book. The case of We Go To The Gallery is illustrative of the tension between artists and the establishment that’s at stake. The agonising bureaucracy of application procedures alongside the emphasis on obscure criteria of accessibility rather than quality and originality of artwork prevents artists from getting any real return for their efforts and serves only to discourage them. Contrarily, crowdfunding platforms like Kickstarter and IndieGoGo allow artists to reach and interact directly with their target audiences, receive valuable feedback from and the immediate support of the community. Essentially, crowdfunding cuts out the middleman, the bureaucratic machine, and lets the public make the call about which ideas they want to come to life. ‘If the project is good, if the idea is good, people will want to see it materialise and will support it,’ Miriam believes. ArtMap London’s campaign is another excellent example of this, with 100% of the asking sum gathered in less than two weeks and funds still coming its way in a steady flow. This said, despite obvious advantages, crowdfunding has not yet become a common trend in the arts. The business and tech worlds have long since been taking full advantage of the model, with some products becoming real success stories, such as Kickstarter-funded Oculus Rift recently being bought by Facebook for $2bn. However, the situation might be changing sooner than expected, with a real heavyweight entering the game. On June 17, 2014 The Art Fund has launched its own crowdfunding platform. Art Happens allows museums and galleries around the country to put forward proposals for exhibitions, conservation, restoration, reconstruction and other projects, and to seek support from the public. In the austerity era of ever increasing government cutbacks on art and culture, asking for more money from the public seems like a reasonable alternative. The perks of supporting such campaigns are, in this case, also the rewards that the donors receive, including museum memberships, original artworks and unique experiences, such as going for a burger with the Chapman brothers, whose exhibition is being campaigned for by the Jerwood Gallery in East Sussex. Jake Chapman is really hopeful for success ‘not least because we can get back to Hastings to see our mum and dad.’ That’s really sweet, Jake, but I’d rather save a Van Dyck for the nation.